Seoul and Pyongyang on Tuesday held high-level talks at the truce village of Panmunjom and decided that North Korea will participate in the 2018 PyeongChang Winter Olympics in South Korea and a military meeting between the two sides will be held, bringing about a turning point in tense bilateral ties in the past year. Domestic politics and the international environment have allowed inter-Korean relations to improve. It is the result of the two countries strategically looking at their national interest. North Korea has been pursuing the goal of using nuclear weapons and missiles as a bargaining chip to force the US to negotiate. As Pyongyang believes its initial goal has been reached, it should suspend development of nuclear weapons to avoid the risk of war with the US. The UN Security Council Resolution 2397 imposed new, harsher economic sanctions on North Korea. Being caught up in diplomatic isolation and economic hardships, it is urgent for North Korea to improve relations with the South to obtain economic benefits. In addition, North Korea wants to use the Winter Olympics, which provides an international platform, to create a peaceful atmosphere of "inter-Korean unity and reconciliation" for promoting peace talks with the US. For South Korea, the Moon Jae-in administration needs the political achievement of a peaceful Olympics to honor its economic commitment made in the presidential election. It also realized that North-South détente is necessary to address the nuclear issue. The easing of tensions between the Koreas has come about because of the positive interaction, reconciliation and cooperation between the countries. To rely solely on sanctions for deterrence doesn't work. In addition, the Moon administration, under pressure from conservative forces since it took office, is in need of a breakthrough of a thaw in ties. To ease inter-Korean tensions also demonstrates the success of Moon's policy of "peaceful cooperation" with Pyongyang and his firm conviction of opening up new vistas for North-South relations and thus establishing a historical status for himself. 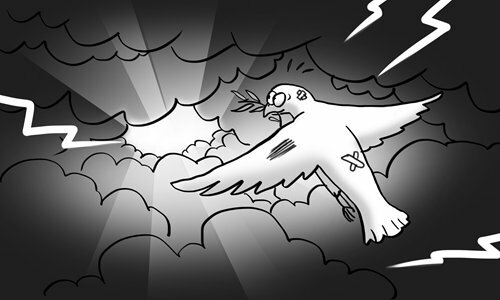 All parties in Northeast Asia do not want to see turbulence on the Korean Peninsula. China welcomes and supports the two sides in taking the opportunity of the PyeongChang Winter Olympics to make concrete efforts to improve relations, ease tensions on the peninsula and realize the denuclearization of the peninsula. The Trump administration expressed full support for inter-Korean dialogue, proposed conditional talks with North Korea and postponed the US-South Korea military exercises. International opinion varies on the improvement in inter-Korean relations. There are three positive aspects. First, the détente lowered the risk of war as new UN sanctions intensified the standoff between the US and North Korea. Second, it may become a turning point for the peninsula and point to a new direction. Third, it is an opportunity for all parties to reach a new consensus on peaceful settlement of the North Korean nuclear issue and work on the "suspension for suspension" proposal. The success of talks is a good start and the détente is temporary. Inter-Korean relations have reached a crucial point and the two sides cannot bypass the US as the real improvement in ties depends on the US policy toward North Korea. We can expect that improved inter-Korean relations will bring about more interaction among the countries involved. Assistant Foreign Minister and Special Representative of the Chinese Government on Korean Peninsula Affairs, Kong Xuanyou, visited Seoul on Friday and Saturday last week and exchanged views with Lee Do-hoon, special representative for Korean Peninsula peace and security affairs. It is for all parties to cherish such historic opportunities and engage with each other. The outcome of the inter-Korean talks should be regarded as the experimental version of the "suspension for suspension" proposal. The demand that North Korea suspend its nuclear and missile activities in exchange for a halt in joint US-South Korea military drills is in the interest of all parties. The parties to the dispute should work together to implement concrete steps in an environment of goodwill, turning the experimental version into an upgraded version for settlement of the nuclear issue so the détente can become a new opportunity for peaceful settlement of the problem.